College students regularly go through some sort of financial struggle while in school. This struggle is often materialized as hunger when students can’t afford basic food needs. Salt Lake Community College recognizes this issue and has tried to alleviate a little bit of the burden on students by creating and providing access to the SLCC Bruin Pantry. 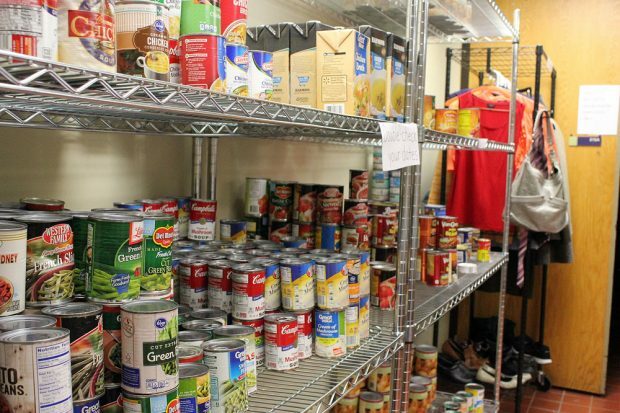 In partnership with the Utah Food Bank, the South City Bruin Campus Cupboard opened in the fall of 2013 to provide basic food items and toiletries to SLCC students. In 2017, the food pantry was expanded to include a location at the Taylorsville Redwood Campus. A study published in April 2018 by the Wisconsin HOPE Lab concluded that 42% of community college students struggle with food insecurity. Food insecurity can lead to minor instances of hunger or, in the extreme case, malnourishment. Luckily, most students are fortunate enough to avoid severe malnutrition, but any level of food insecurity can be enough to tamper with a student’s academic performance and overall well-being. That’s why programs like the SLCC Bruin Pantry are indispensable to the success of a student and the needs of a community. To use the Bruin Pantry, a student only needs to bring their student ID card and sign in at the pantry. Students are able to take home two grocery bags of food every 30 days. The South City Bruin Campus Cupboard is located in room SCC 1-061D. They’re open Monday through Thursday from 8 a.m. to 3 p.m. The Taylorsville Redwood Bruin Pantry is located at the Student Center in room STC 015 and is open Monday through Friday from 8 a.m. to 3:30 p.m. Hours may vary depending on volunteer availability. Students can visit the Utah Food Bank for additional information about Utah food pantries.